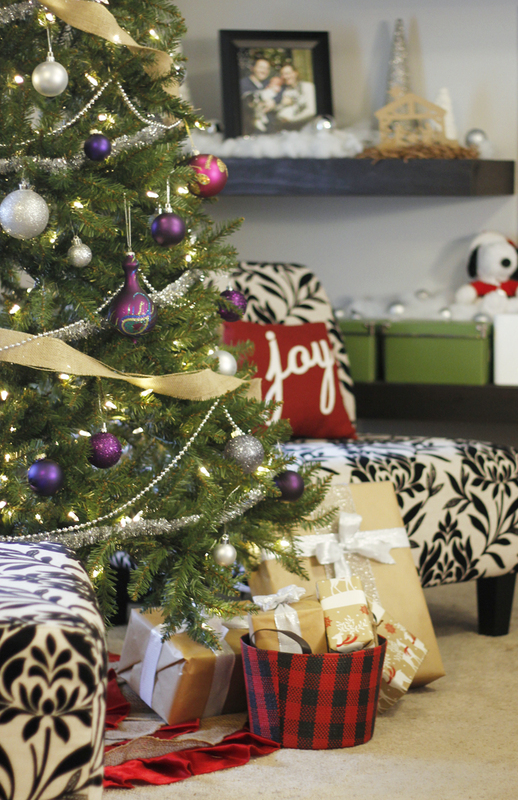 A Silver & Purple Christmas Tree with glittery ornaments and some rustic burlap. Check out this gorgeous tree for more beautiful tree inspiration! I am not ashamed to admit that Christmas music starts getting secretly played around July in our house. It makes me so happy and always can put a smile on my face! My dear husband, however is not so jolly when it comes to this old habit of mine. Every year since before we got married he has the strict rule of absolutely no Christmas until after Thanksgiving. Until this year…. This year I got smart. Now that I have a husband and child with birthdays five days apart that fall right after Thanksgiving, I used it as a great excuse to start pleading my case. And then I whipped out the whole “but I need to write a blog post about Christmas at the Garvins.” And finally I realized we were getting somewhere. Friends, I am so happy to say I got one full extra week of Christmas cheer in my home this year. Christmas tree. Snowy fluff. Glistening ornaments. So much happy!! 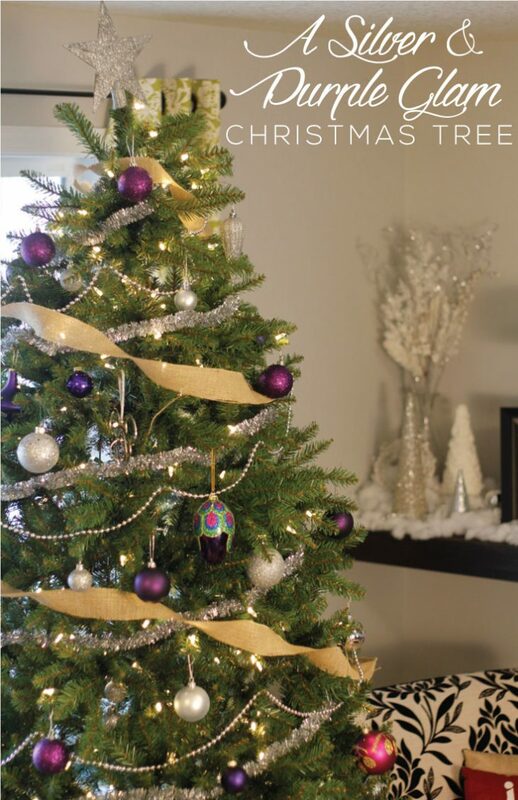 I am so excited to share with you our silver & purple glam Christmas tree for 2015! Every year I get a little better at decorating (you can see last year’s here), but if you’ll let me gloat for a minute, I must say I really knocked it out of the park this year!! To say I am in love would be an understatement. If you want to see me or talk to me or anything, just know you’ll find me flittering my eyelashes in front of our glamorous Christmas tree. Swoon! Before we decided to make a last minute Christmas tree theme change this sweet little girl helped put ornaments on the tree. Well, more she just poked at this weird prickly thing that was in our living room when she woke up from her nap, but she was too cute to not share. 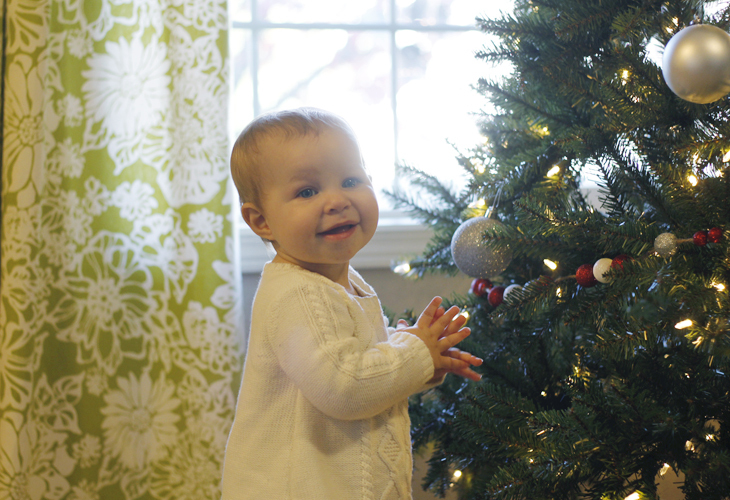 You can see her first reaction to this Christmas tree business here. This year, because we are celebrating Clara’s first birthday in just a few days we decided to do silver and purple, the same color scheme for her party. Lucky for us I randomly stopped at Ross last week and found one box left of 50 silver glitter and purple ornaments for only $10!! No, they weren’t glass ornaments but they had strings unlike the cheap ornaments I have from the Dollar Tree where you have to put in metal hooks. The shiny garlands you can see are from Target. Only $3 for 15 feet. We have three of those garlands on the tree. The silver bead garland I found at Target for $5 for 50 feet. And of course what Burlap and Babies Christmas tree wouldn’t be complete without some burlap?! I bought this burlap floral ribbon at Joann’s. Especially around the holidays, if you look in the non-seasonal section you’ll typically find much better prices, plus you’re more likely to be able to use those 40% off coupons. 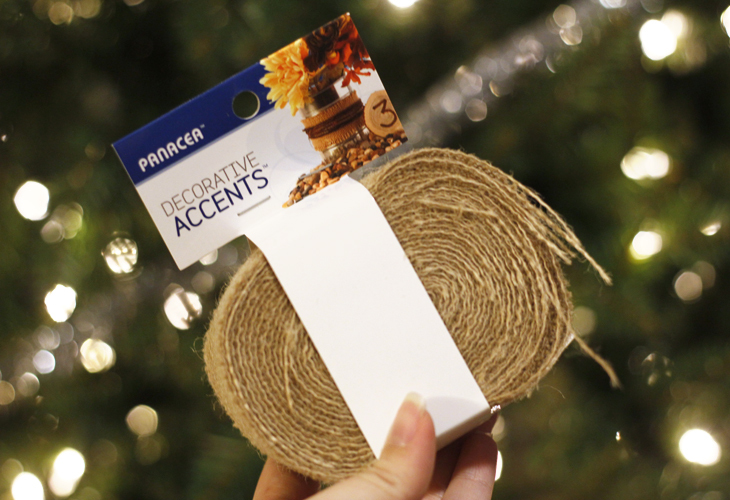 This burlap added the perfect bit of rustic glam to our tree. And then for the final trimmings….the ornaments. The pretty fancy purple ornaments are from World Market that I borrowed from my friend, Erin who recently started a blog at Clever Bloom. Go check her out! She has some darling Christmas pillows made from napkins and the cutest little stick nativity scene ornaments. These ornaments added some fun color and variation to the overall look of the tree. Of course, what tree isn’t complete without some finely wrapped presents in craft painters paper and glittery silver ribbon? 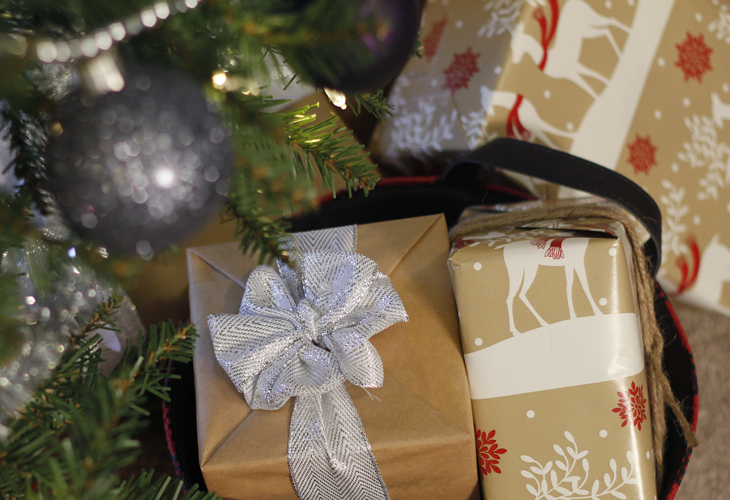 Be sure to check back later in December for my trick on quick and easy gift wrap. This darling little plaid cloth bin to hold smaller gifts I picked up in the dollar section at Target. #win! 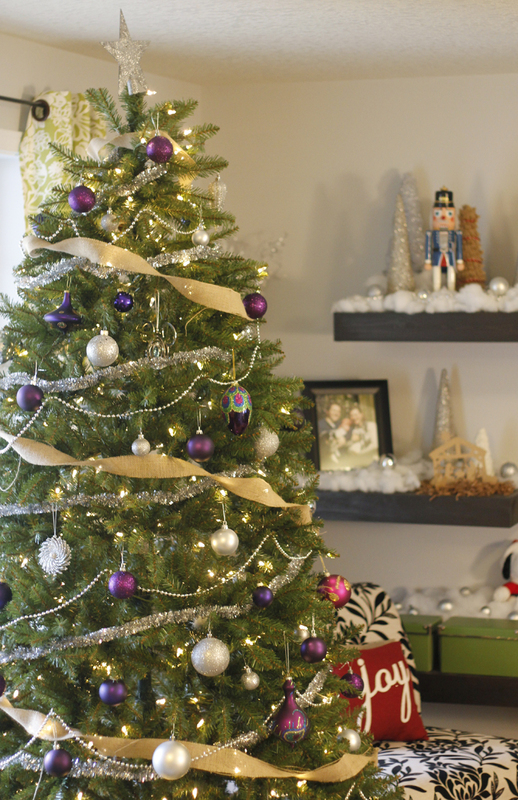 I love how our tree turned out and I can’t wait to show you the rest of our Christmas home tour next week! 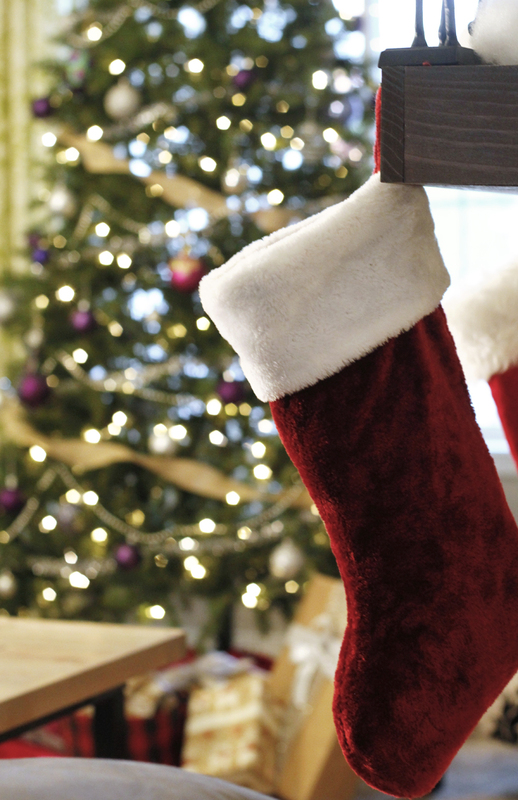 Be sure to stop by to see the rest of our home decked out for the holidays! 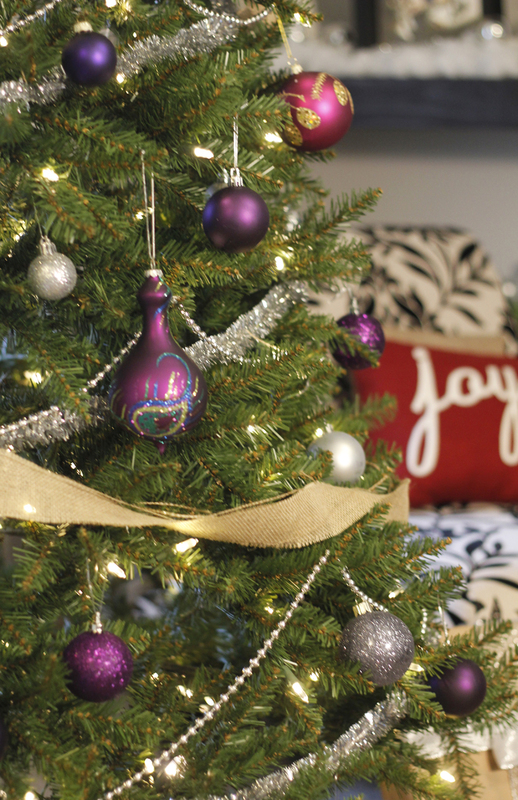 What’s your fav detail of this silver & purple Christmas tree? I know it’s just a minor detail but the 50 ft silver bead garland really helped give our tree that extra little pizzazz it’s been screaming for the last few years. This year I am joining in a fun Christmas link party each week for four weeks. 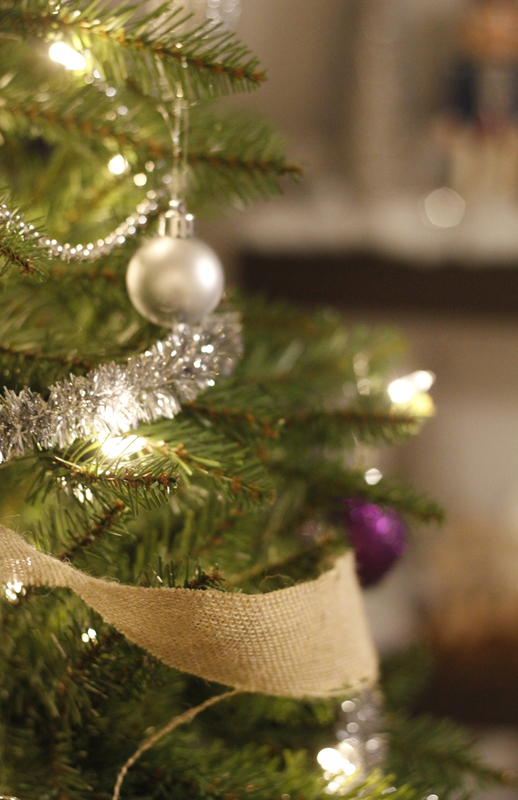 Be sure to stop by and link up your own gorgeous Christmas trees at this week’s party.